Incident Details: Penrith MRT requested assistance from all Lakes teams to find a 78 year old lady with dementia who had disappeared in the Crosby Ravensworth area whilst walking her dog in an area which was both complex and varied. 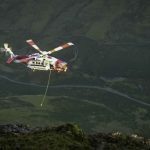 Penrith had already mounted an extensive search overnight with their own Team, and Lake District Mountain Rescue Search Dogs, 3 of which were supplied by Keswick. 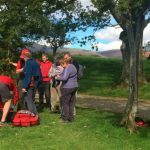 Four Team members and two Keswick search dogs attended from 9 am, as well as substantial numbers of rescuers from a variety of Lakes MR Teams, RAF Leeming MRT, a Sea King from RAF Boulmer, and search dogs from LDMRSDA and SARDA England. The photo shows Keswick Search Dog Beck searching one of the many areas of limestone pavement. Despite a huge amount of ground being covered, the lady and her dog were not found on this search. Sadly, her body was found on the 19th some 7 km from her home.